Most people who trust Christ do so before they turn 18. 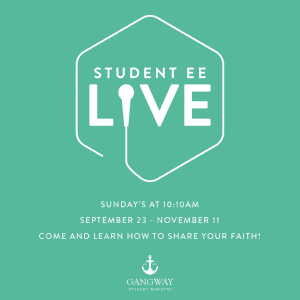 Therefore, to empower and mobilize students to share their faith, Coral Ridge Presbyterian Church will host Student Evangelism Explosion (EE) classes beginning Sunday, September 23, at 10:10 a.m. in Gangway. The student ministry invites anyone who wants to reach their generation for Christ. The Summer EE Mission trip will include all students who attend the Fall and Spring semesters of EE.